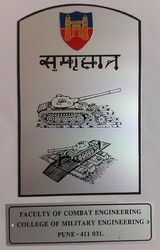 We manufacture Badges required for Armed Forces as per exhibited sample in Brass & St.Steel. 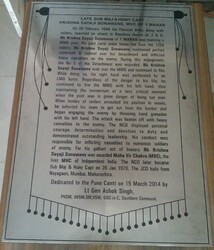 We make Plaques to be displayed in Command Offices, Institutions along with Details of soldiers of any rank who have become Martyrs. They have shed their blood for our country saving borders, People from Terrorism, Border Insurgency & attacks by our neighboring Countries and have been honoured by our Armed forces & Governmet of India. We manufacture logos for Indian Armed Forces to be put on Shirt sleeves in Brass & St.Steel as per displayed in attached photograph. Alu, Brass, St.Steel & Copper. We make Name boards for display for exhibitions. Pricing depends on Material type, Size and material Thickness.